When I initially started my blog I stated my former occupation as the control room inspector (now retired) at Cumbria police headquarters. I hope here to improve walkers knowledge of an incident through this experience and my frequent walks in the fells. 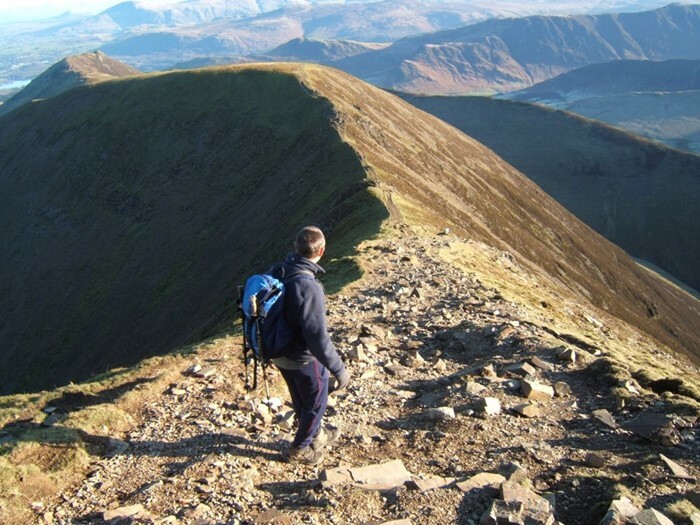 Some processes have evolved since my leaving and I have tried to keep myself updated on what those are and how they impact on safety on the fells. My specific experience is within Cumbria, The Lake District, though many of the issues I discuss are relevant to other mountainous areas, though the protocols may vary. I have no intention here of giving you guidance on what to take and how to conduct yourself on the fells, the mountain rescue teams make strenuous efforts in this regard through their internet sites and displays at annual shows, etc. and it is not my area of knowledge beyond what an experienced walker already knows. It has been said often enough that you should be adequately clothed for the expected conditions, carry and know how to use a map and compass and any other navigation aid is a suplement to these 'must haves'. I'll put down a marker here by stating I hold the volunteers of the mountain rescue service in the highest regard, through their expertise, commitment and bravery. Let us start firstly with an incident which occurs on the cumbrian fells that you are either involved in or have come across. You ring for the mountain rescue and if you think you are going to get the mountain rescue on that initial call, then this has potential for going seriously adrift immediately. The initial 999 call goes to BT who will ask you 'which service do you require?' And your reply is Police, and then ask for 'Mountain Rescue'. Remember the M.R. teams are all volunteers and have to earn their own living. You will get the police communications centre who will record the information you give and through a system will pass this to the M.R. team for that area. Where incidents go wrong is the information may be imprecise and it is not given to a person (the operator) who knows the fells intimately, if at all. That operator may never have been on a fell in their life or have any sense of where that is. It is worth noting that mountain rescue incidents probably account for a quarter of one per cent of all calls to the police control room and an operator cannot be expected to be versed in every specialist area. They will take the information you give also asking questions, record it, and pass it on to the mountain rescue team. If you say Eagle Crag to an operator, you are probably describing the Wainwright at Stonethwaite, but I know of three other such named crags and know of one incident where the wrong MRT was being called out due to this simple error of location. There are two Seathwaites, two Harter Fells, two Gris(z)edale Pikes, White Side & Whiteside, before we even begin to move on to tarns or forests, Gills, becks of the same name. Difficult as it is a caller must remain calm, you will be asked a series of questions and these have a purpose so answer them, no matter how drawn you are to a casualty. Map references are excellent especially these days with navigation devices or applications on smart mobiles that give you just this, your phone signal itself will not give it, you will need to pass this to the police operator. There are routes I have walked hundreds of times but I still take a GPS so if injured I can give an exact reference for the team or heli. Many mountain leaders will state you should know where you are off a map at all times. This would be utopia but the reality is to deploy an air resource, the six figure map reference is a godsend to the MRT and heli. Many people think they know where they are but have gone off course by 180 degrees. One incident was a full team of six men who walked a Bowfell horseshoe from Langdale and ended up in Boot. b) Give a six figure map reference (bigger may add to the operators confusion and is too accurate) stating whether from a GPS or worked out from map. d) State where you set off from, ie., Seathwaite, Borrowdale. e) State by what route you ascended, ie, Corridor route or Grains Gill. g) Don't move from that location. Regarding g) one mountain rescue team spent all night trying to locate a lost individual who walked and walked. The MRT were checking locations and he wasn't there, but later he was, though the MRT weren't. They finally stumbled upon him in Glenderamackin valley, where he had originally got lost (and still was). At c) above, don't centre on this. If the mobile signal is lost then knowing we have a serious casualty somewhere in the lake district means nothing without knowing where and you would be surprised at how many calls are suddenly lost. When police officers are being assaulted they are trained to give three things, location, location, location. The police know there is a problem that's why you're on the 999 call, they want to know where you are (and spell it). The police pass this information immediately to the MRT who are the experts on every nook and cranny on their patch. On virtually every mountain rescue they will want to contact you to clear any confusion with the original police contact, so leave someone with the mobile at that location if you can. If everyone drops off the fell to assist the injured party the signal may well be lost for recontacting you. You have not helped the injured party by doing this, though I understand the dilemma if you are the only other person. If no recontact has been made after 15 minutes then recontact the police control via the 999, believe me when I say something needs clarification, it nearly always does. This is still an emergency so if you cannot get through on the new 101 (non emergency) then a second 999 is the appropriate contact method. You are in a mountainous area and will be lucky to get a signal on your own network. The way the 999 system works is where it cannot locate to your service providers network, it will use any network to put in the call. It is vitally important that this point is made because it needs to be understood that when the MRT or police try to recontact you, it can only be via your service providers network and we've already covered that this may not be possible, so without another call you and/or the casualty may be in serious danger through an unnecessary delay. After your first call the MRT have been contacted, if they cannot contact you and you later ring by 101 or 999 the police should be able to transfer this 'live' call to the MRT base station they have by now attended; this was what you had really wanted. On 999 calls the number calling is automatically recorded. If you can, give them every mobile number in the group, particularly on different networks, even if there are six mobiles. You will reach a point where you are satisfied the MRT are en route and now it's merely a question of waiting, so be patient. Different incidents will have different attendance times but the team have to get to base, get changed, travel to the area where they deploy out of the vehicle and get up to the incident. It amazes me at the speed they respond, but to you it may seem an age. Remain calm, they are bending their will and physical limits to get to you. I could go into accounts where this team of volunteers has only been met with verbal aggression at a response time, but I am sure you can imagine the scene. Other areas that require knowledge would include air resource deployment and what is given from a mobile emergency contact regarding your position but there's enough to digest for the moment here. Enjoy the great outdoors, dress appropriately, act responsibly and keep safe. Never forget the MRT charity box in the pub. If you can afford a pint, you can afford a donation for these selfless individuals, it's ultimately for your rescue when all is said and done. If you liked this article, please follow us on Twitter and/or Facebook; links below. Please also look through the rest of www.MountainSafety.co.uk, as the many articles in here could prevent you from needing Mountain Rescue in the first place. Start with the links below.